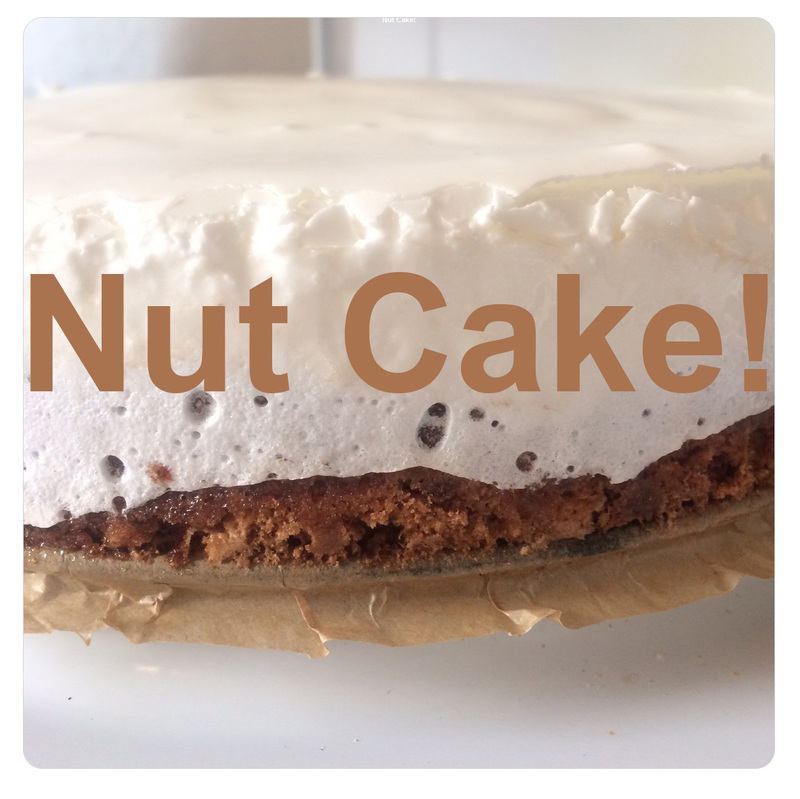 200 g ground hazelnuts, 6 eggs, a dash of salt, 1 package vanilla sugar, 1/2 package baking powder, 250 g sugar, 150 g flour (I used gluten-free flour), 50 g apple jelly, 200 g powdered sugar. Stir egg yolks, sugar, vanilla sugar and salt until creamy. Add the grounded nuts. Stir gently. Add 4 beaten egg whites, baking powder and flour. Fold in gently. Pour the mixture into a greased cake tin. Bake for app. 60 minutes at 180°C. Spread warm apple jelly onto the still warm cake and top with glazing (For the glazing stir 2 egg whites with 200 g powdered sugar until creamy). Bake for another 15 minutes at 100 °C in the slightly opened oven. 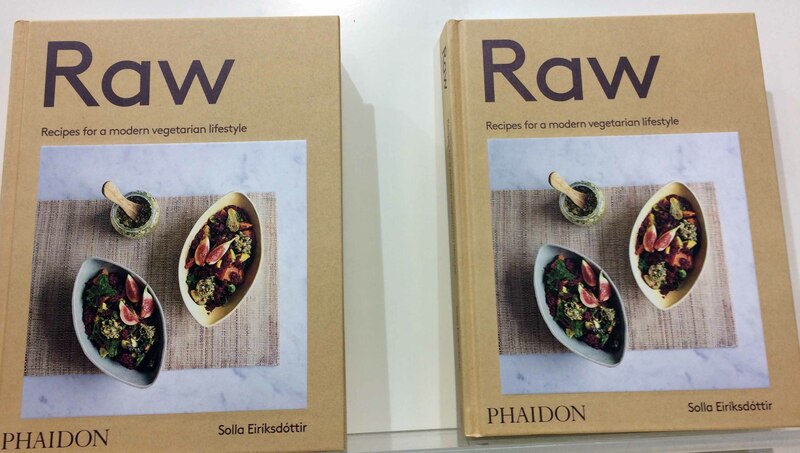 Love at first sight: Raw by Icelandic chef Solla Eiriksdottir. All pics by Franzi, made on the #fbm16. 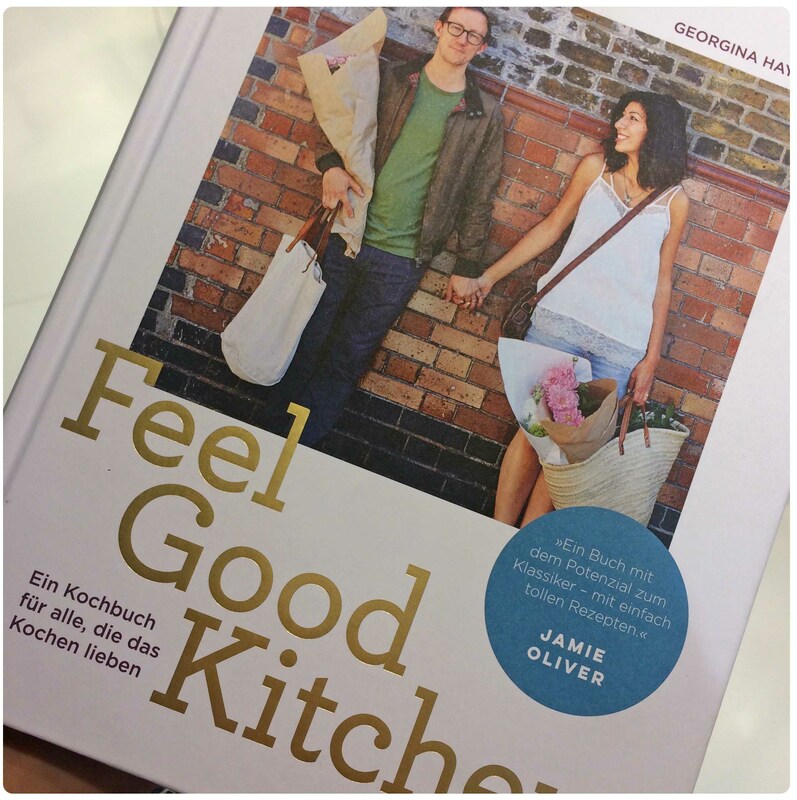 Cookbooks are a big passion of mine. 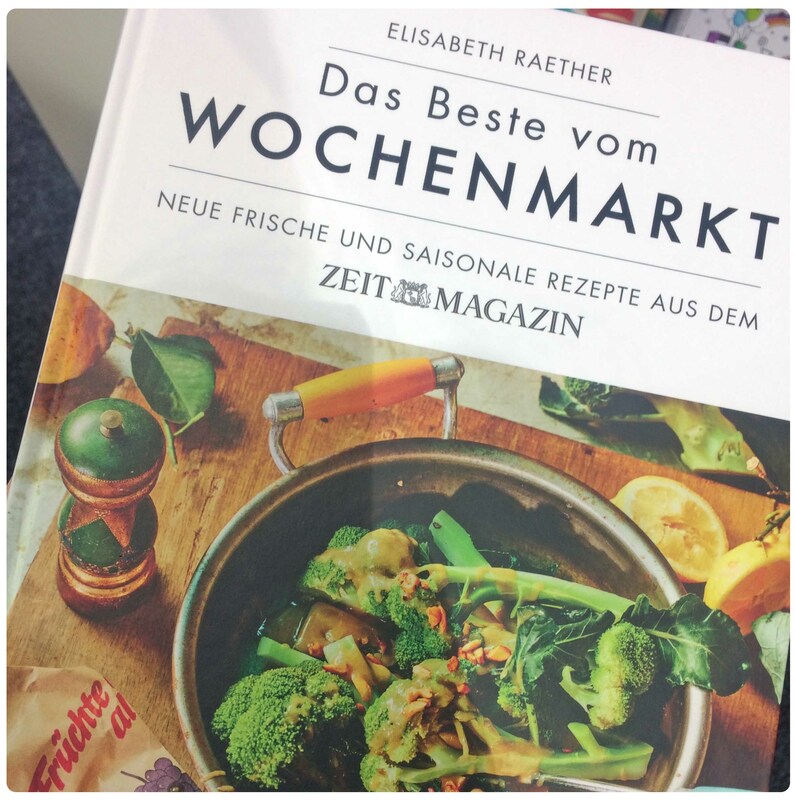 Maybe I shouldn’t wonder why my notebook is now full of new cookbook titles after the Frankfurt book fair #fbm16. Here are (only) twelve of my favorites I found this year – most of them were published in 2016, some re-published and some a bit older :). 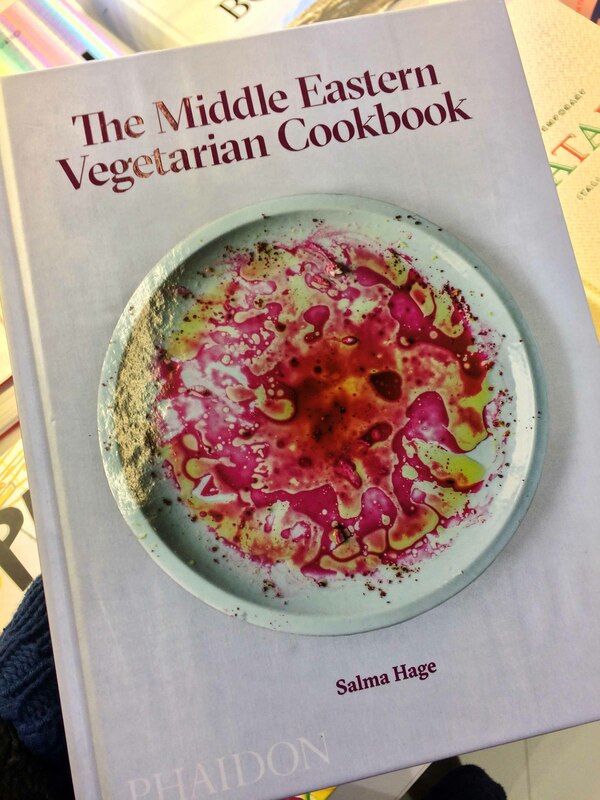 Vegetarian, the Middle Eastern Way: The Middle Eastern Vegetarian Cookbook by Salma Hage. Tinned fish recipes. Really! 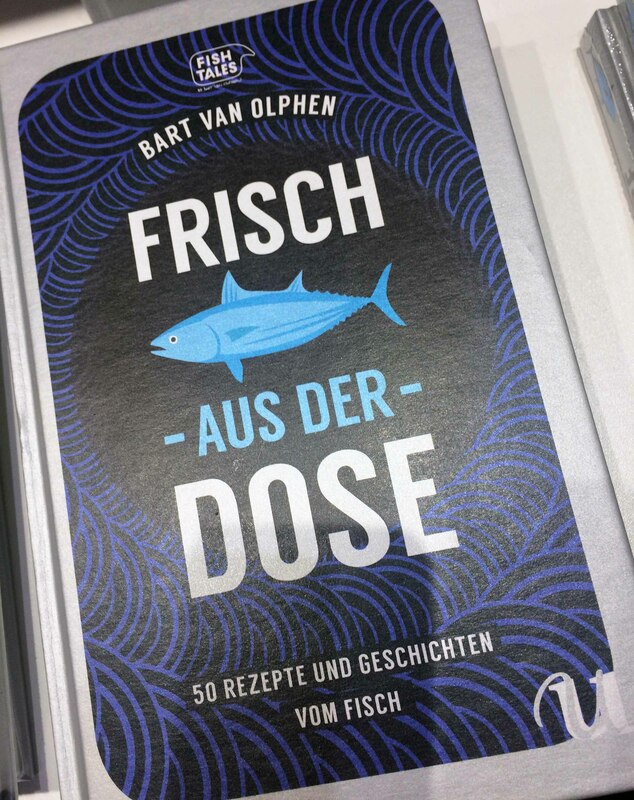 (German): Frisch aus der Dose by Bart van Olphen. 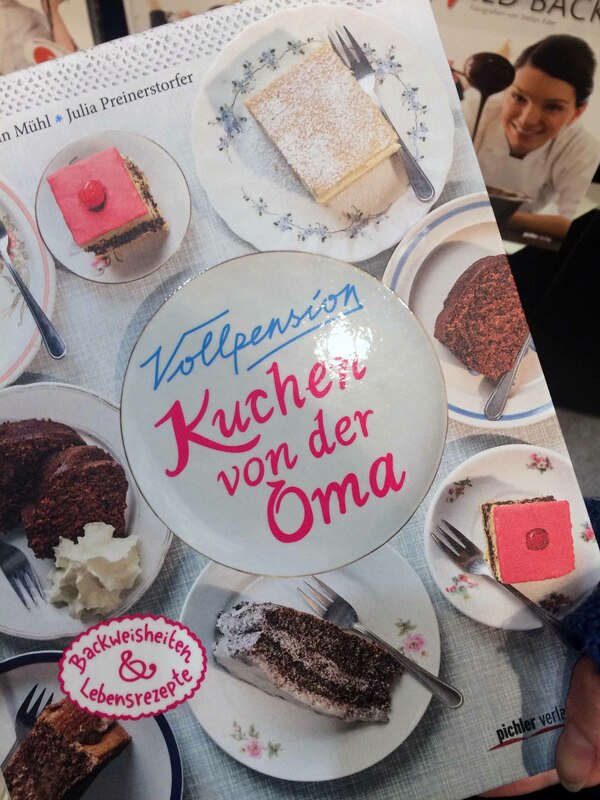 My last coffeehouse discovery Vollpension in Vienna has now its own recipe book (German): Vollpension – Kuchen von der Oma. 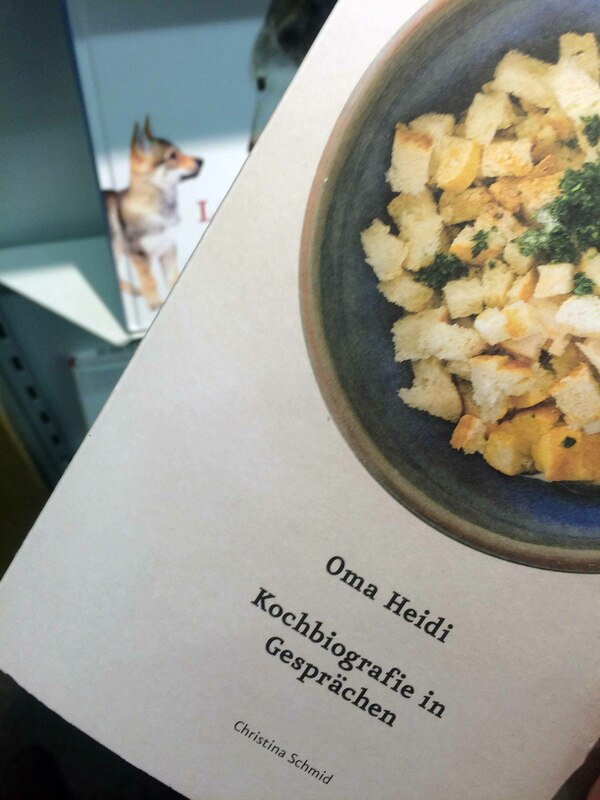 A recipe biography and a dialog between the grandma and her granddaughter (German): Oma Heidi by Christina Schmid. 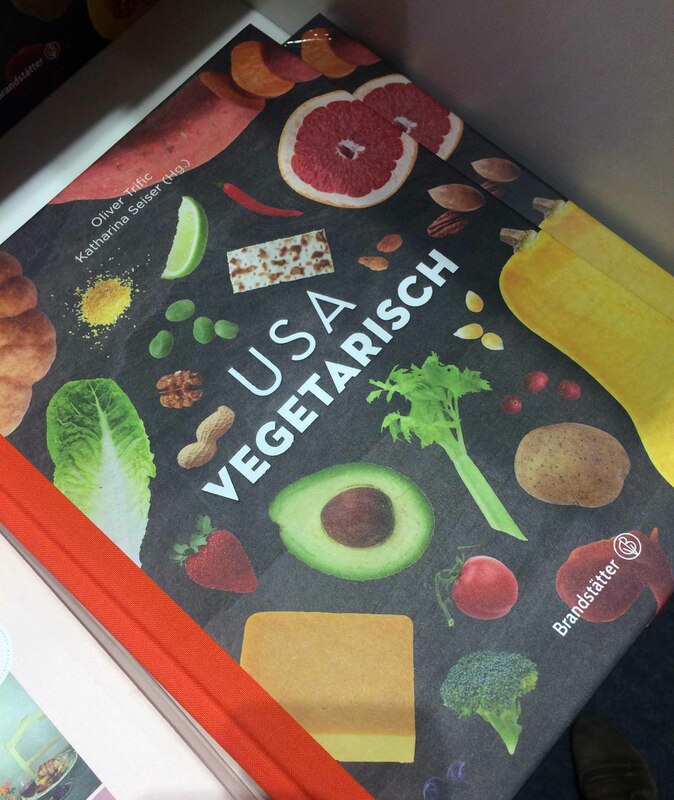 Vegetarian cooking – the US way (German): USA vegetarisch. 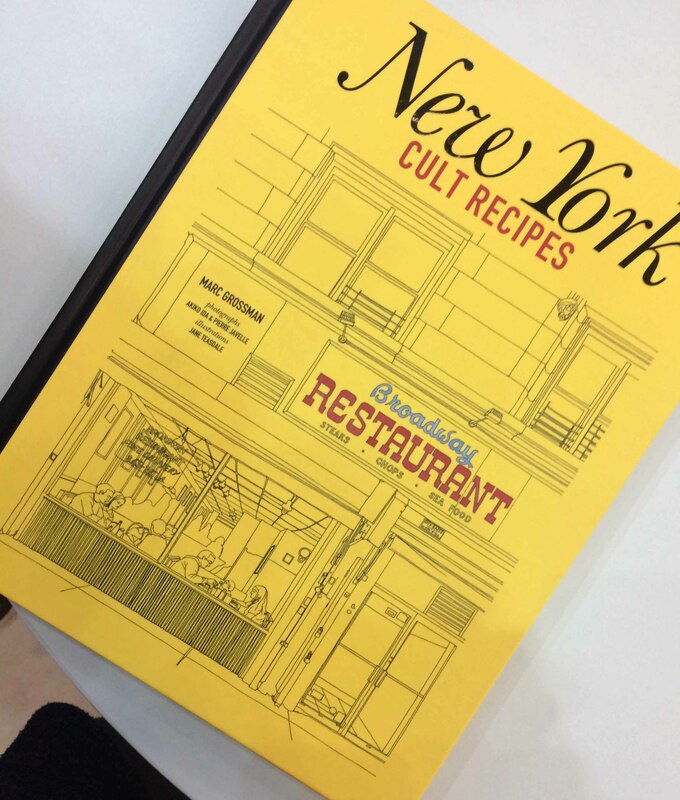 More than only cheesecake: New York Cult Recipes by Marc Grossman. 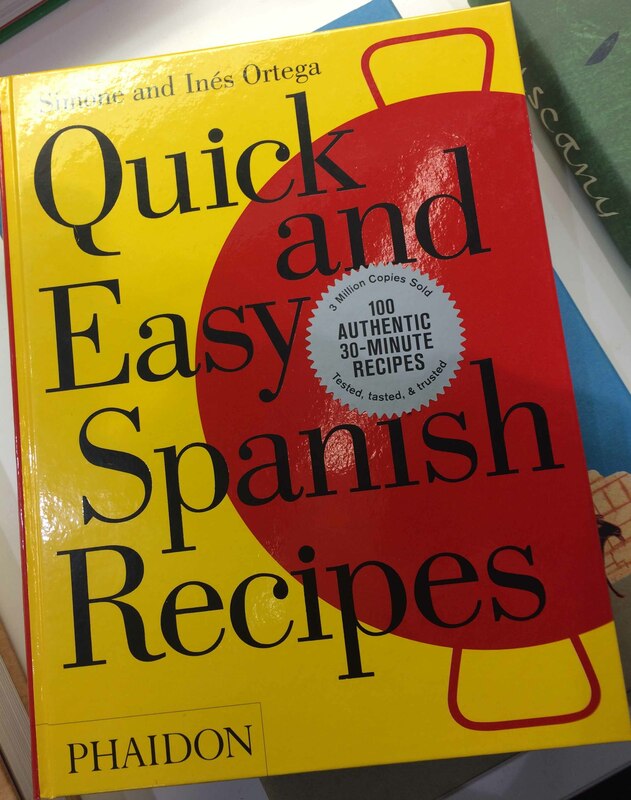 I already have the Italian version, now I need this one as well: Quick and Easy Spanish Recipes by Simone and Inés Ortega. 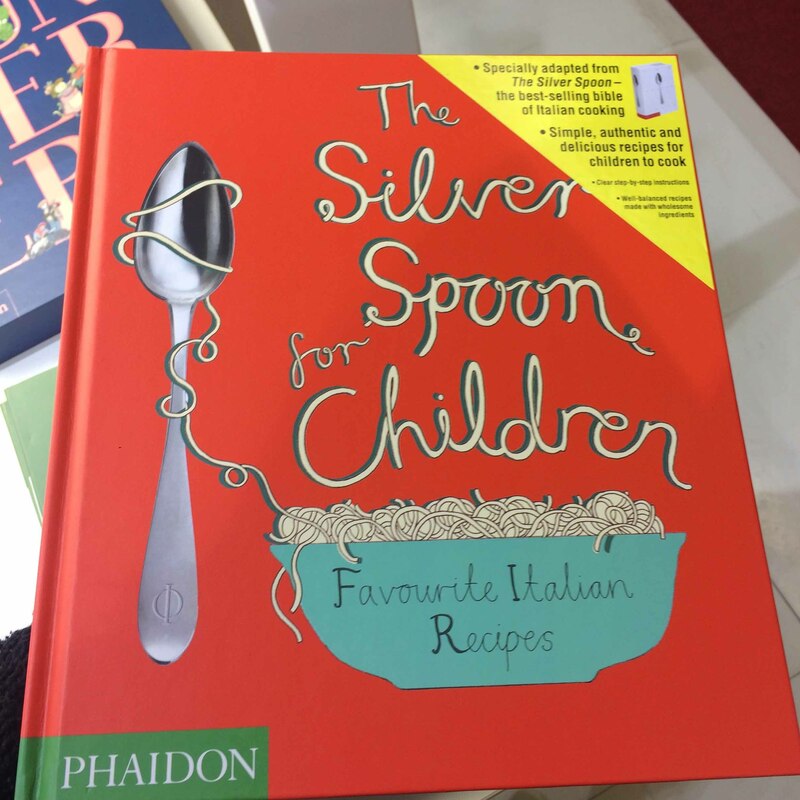 One of my absolute favorites this year: The Silver Spoon for Children – Favorite Italian Recipes!!! 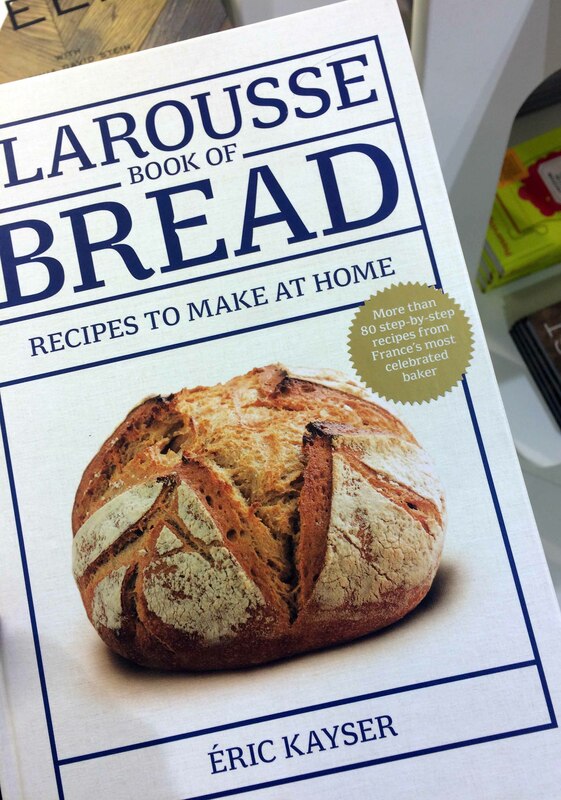 I am still a bread baking addict: The Larousse Book of Bread by Éric Kayser. 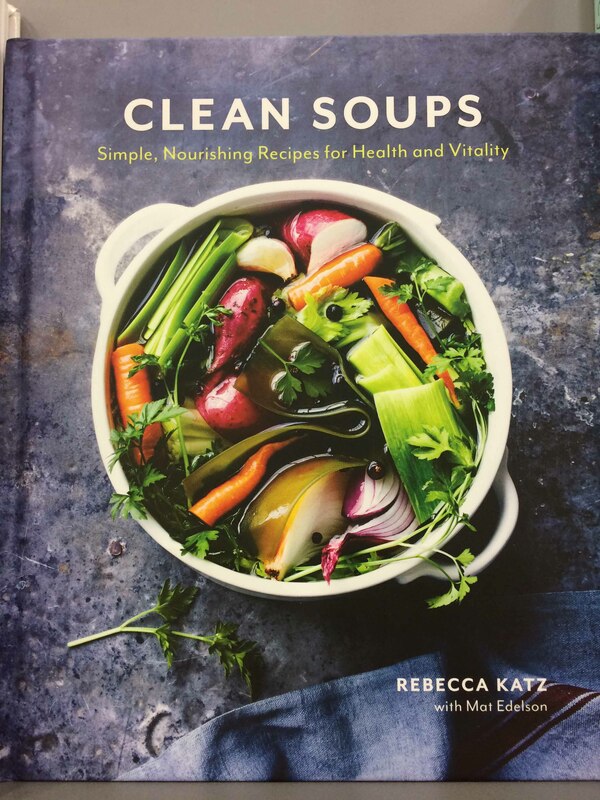 Not only on cold days: Clean Soups by Rebecca Katz. 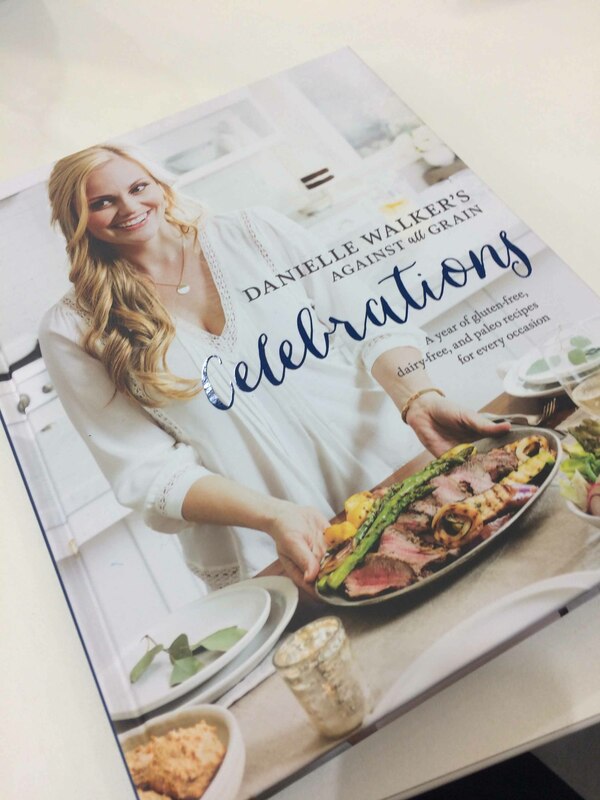 Another big favorite of mine – because it answers the question what to cook on special occasions like X-Mas or a dinner with friends while living gluten-free: Danielle Walker’s Against All Grain Celebrations. 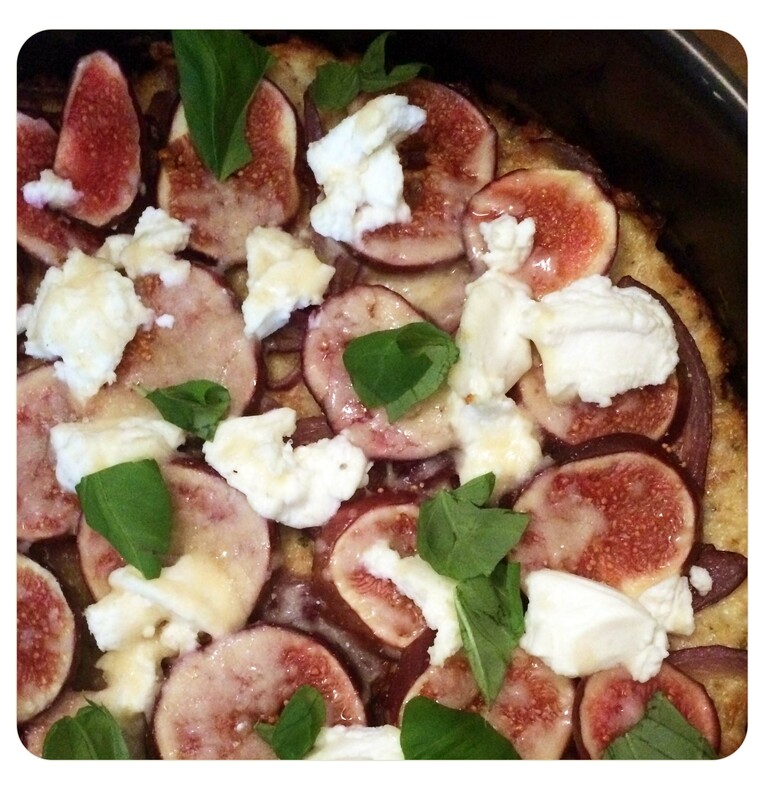 Cauliflower Crust Pizza with Figs! Since eating gluten-free, I think a lot about pizza (and pasta). I just miss my pizza treats from time to time. But then I read that one can actually make a pizza crust with cauliflower instead of flour. Yes, cauliflower. 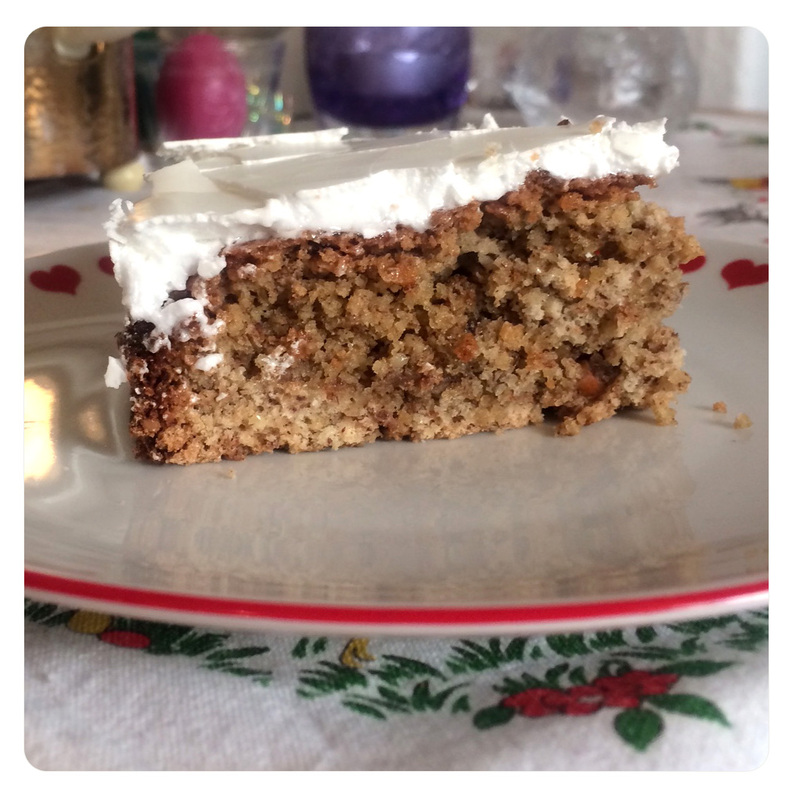 Last weekend I tried it – topped with figs and ricotta cheese. What can I say?… The crust preparation took some time, but it was absolutely delicious! 1 cauliflower (chopped into florets), 2 eggs, 1 cup grated parmesan cheese, 2 TSps Herbs de Provence, 1/2 TSp salt, 1 onion (cut into rings, caramelized), 4 figs (cut into slices), 1/2 cup ricotta cheese, basil leaves. Add the chopped cauliflower to a food processor, grind until small grains form. Spread the cauliflower over a parchment-lined baking sheet, and bake for 15 minutes at 200°C. Remove and let cool. Place cauliflower in the center of a tea towel and wrap it into a ball. Squeeze out as much of the water as possible. Place the drained cauliflower into a mixing bowl, add eggs, salt, herbs and parmesan cheese – stir together. Line a small cake tin with parchment paper. Spread the crust mixture into the tin. Bake for 15 to 20 minutes at 225°C. Allow the crust to cool slightly before adding toppings. Distribute the caramelized onion, the ricotta cheese and the sliced figs over the crust. Bake the pizza for 15 minutes at 225°C. Garnish with fresh basil. 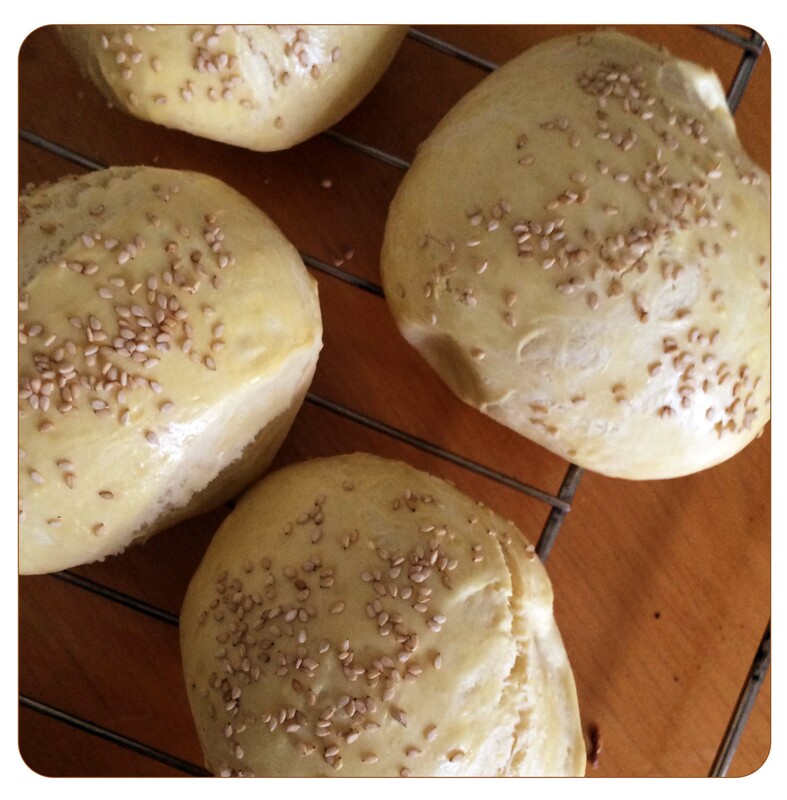 Did you ever prepare your own burger buns? I tried it a few weeks ago. It was my first time and now I will maybe never buy them again – the home-made ones were simply perfect. 250 ml milk, 50 g butter, 600 g flour, 25 g fresh yeast, 1 TSp sugar, 1 egg, 1 TSp salt, 1 egg yolk, 2 TblSps heavy cream, 2 TSps sesame. In a pot, heat the butter and the milk. Add flour into a big bowl and press a hole into the center. Add some milk into the hole, crumble the yeast onto the milk, sprinkle with sugar and gently stir. Add some flour from the edge of the hole. Mix gently, using a wooden spoon (only the center – you still have flour around it). Sprinkle with some more flour, cover with a kitchen towel and let rest for app. 15 minutes. Add the rest of the milk, the egg and the salt, mix until you have a smooth dough. Cover with a kitchen towel and let rest for 45 minutes. Form the dough into a roll and cut into 8 pieces. Form into buns and put onto a baking tray. Let rest for 15 minutes. Mix the egg yolk and the heavy cream, spread the buns with the mixture. Sprinkle with sesame. Bake at the lowest rack for app. 20 minutes at 200 °C. Cheese Cake with Strawberry Sauce! 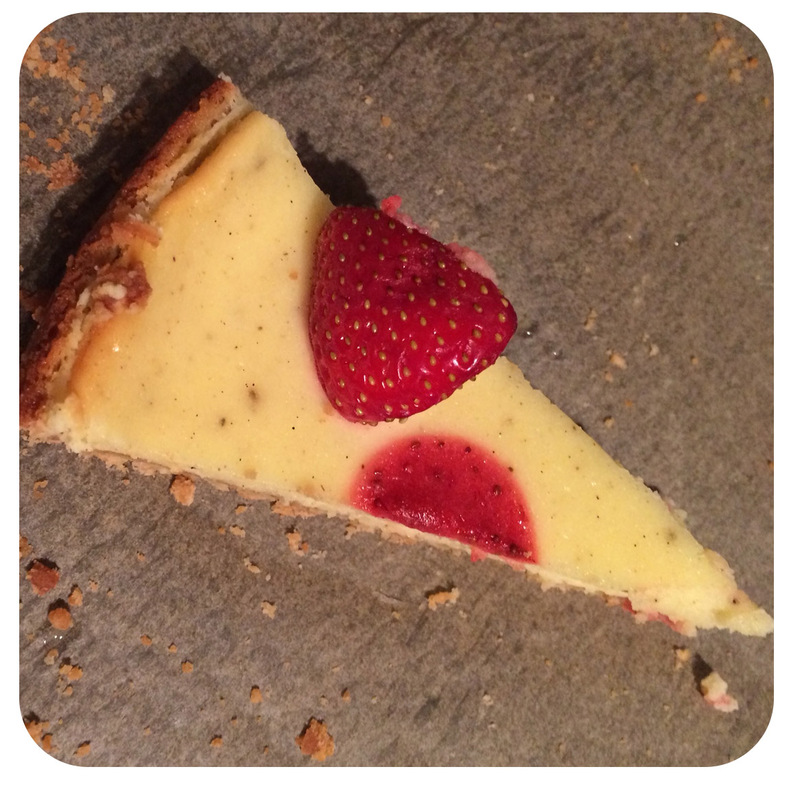 I baked this cheese cake with strawberry sauce two weeks ago for a birthday party and it was a great success. While baking a cheese cake I always have to think on my first time I was doing this: During a spring diet a few years ago I decided to bake one as a birthday gift for a friend of mine. It took forever and was finally done around midnight. Big problem: It looked and smelled delicious and I was hungry. Thus, I decided to eat one tiny piece – that needed to be explained the next day to my friend, who was wondering why someone already ate from his birthday cake (but it was totally worth it) :D.
200 g shortbread biscuits , 100 g melted butter, 500 g cottage cream, 125 g crème fraîche, 125 g sugar, 1 package vanilla sugar, 2 eggs, 1 TSp cornstarch, 250 g strawberries, 1 TblSp powdered sugar. In a big bowl, crush the biscuits until they are tiny crumbs. Add the melted butter and mix until you reach a sticky, homogeneous texture. Fill the biscuit-butter mix into a baking tray and use a spoon to press the biscuits even onto the ground of the tray. Store baking tray in the fridge. In a bowl, mix crème fraîche with the cottage cream, the eggs, the sugar, the vanilla sugar and the cornstarch. Add the cream mix on top of the biscuit ground. With a big spoon, spread the top of the cheese mix until it’s even. Bake at 165°C for app. 1 hour. Let rest in the opened oven for another 15 minutes. Decorate with a few strawberries and blend the rest of the strawberries together with the powdered sugar. Serve the cake with strawberry sauce. Cantuccini are the perfect addition for your dolce far niente time ;). Home-made they are not as dry as the imported ones from Italy. Moreover, they also make a perfect sweet gift for your friends! Recipe: Makes app. 40 cantuccini. 500 g flour , 1 package baking powder, 400 g sugar, 4 eggs, 3 egg yolks, 40 g soft butter, 200 g almonds (without skins), 1 pinch of salt. In a big bowl, combine the flour with the baking powder. Add sugar, salt, soft butter flakes, 3 eggs and 3 egg yolks. Mix until you have a crumble dough. 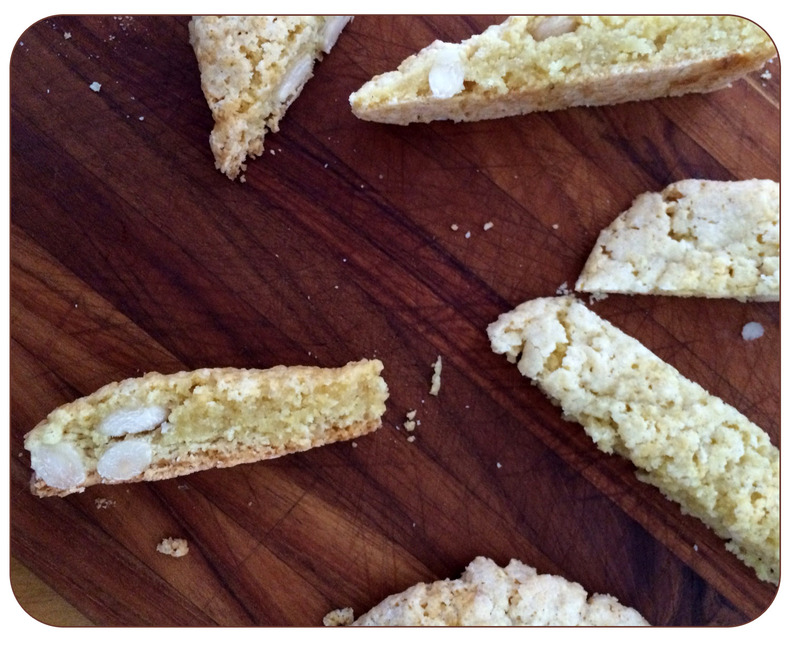 Add the almonds and mix with your fingers. Roll out the dough into four roles and place onto your baking tray (keep a lot of space between the rolls – the dough will melt in the oven!). Whisk the last egg and use it to brush the dough rolls. Bake in the oven on the middle rack for about 25-50 minutes at 160°C until the rolls are golden-brown. Cut the still warm rolls into diagonal pieces. Chill. 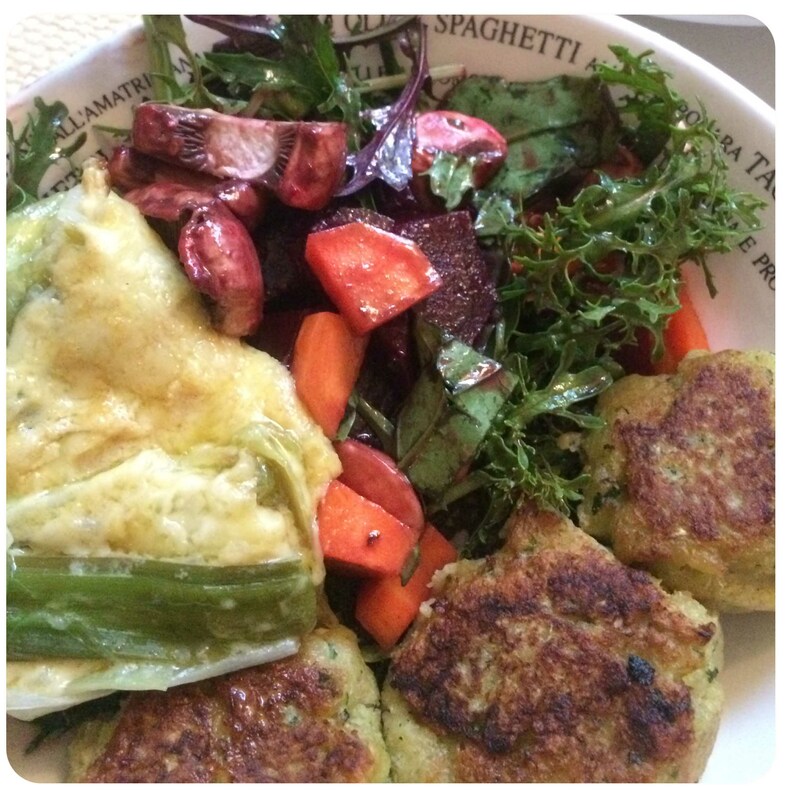 Last week’s courgette-parsnip patties were served together with roasted leek and a wild salad. Like promised, here comes the leek recipe – it’s a vegetarian “evergreen” recipe in my kitchen, which I prepare since I was 12 years old. The complete dish: Roasted leek, courgette-parsnip patties and wild salad! 500 g leek (cleansed and cut into app. 10 cm pieces), app. 30 g soft butter, 2 TblSps grated cheese, 1 TblSp mustard. 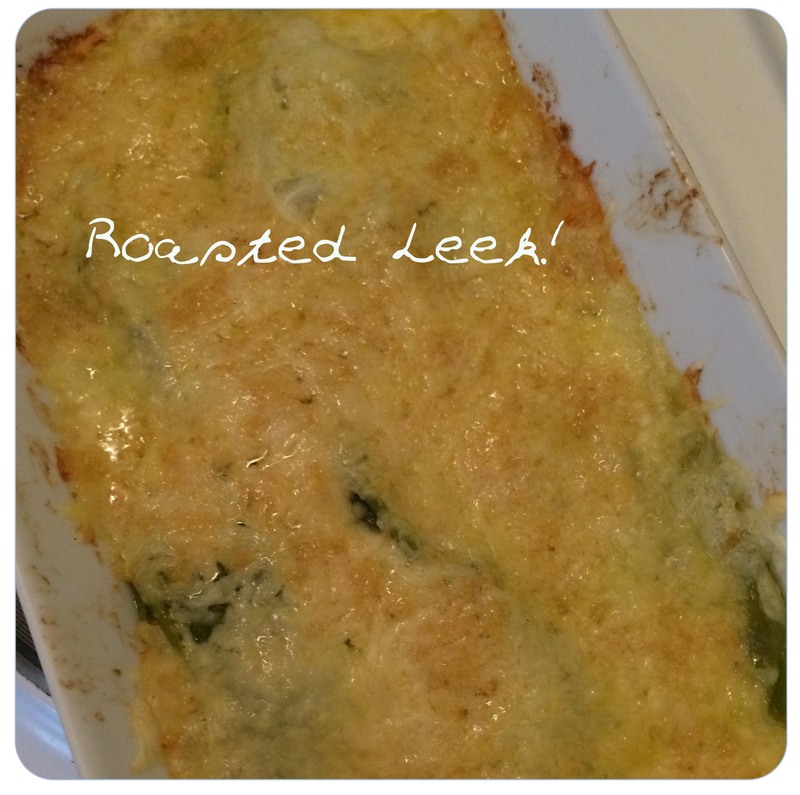 Cook the leek for app. 10 minutes in salted water. Drain the water and put the leek into an oven dish. Prepare a mixture with the grated cheese, the mustard and the soft butter. Spread it onto the leek. Roast in the oven for app. 20 minutes at 200 °C. Muffins are easy-peasy to prepare and good to transport. 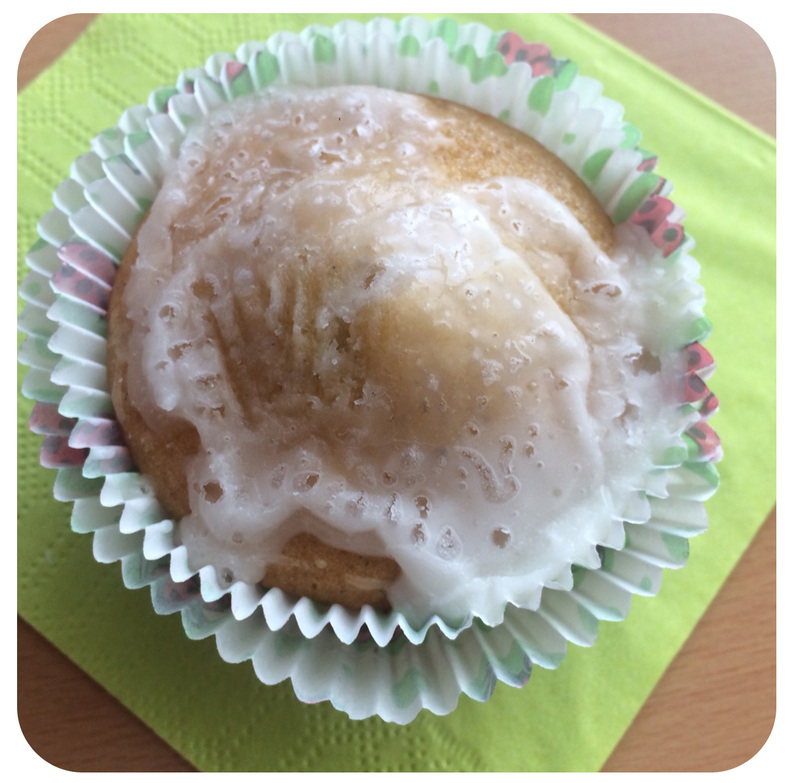 Fanta (orange lemonade) muffins are my favorites and an ‘evergreen’ in my own kitchen. Here comes the recipe :). Dough: 2 cups of flour, 2 cups of sugar, 1 package vanilla sugar, 1/2 cup of oil, 3/4 cup of fanta (or another orange lemonade), 1/2 package baking-powder, 1/4 TSps natron, 2 eggs. Icing: 80 g powdered sugar, 1 TblSp fanta (orange lemonade). Mix all ingredients for the dough, fill into twelve muffin tins and bake at 200°C for app. 15 minutes. Let cool down and prepare icing by mixing 1 TblSp of fanta with powdered sugar. Ice the muffins. 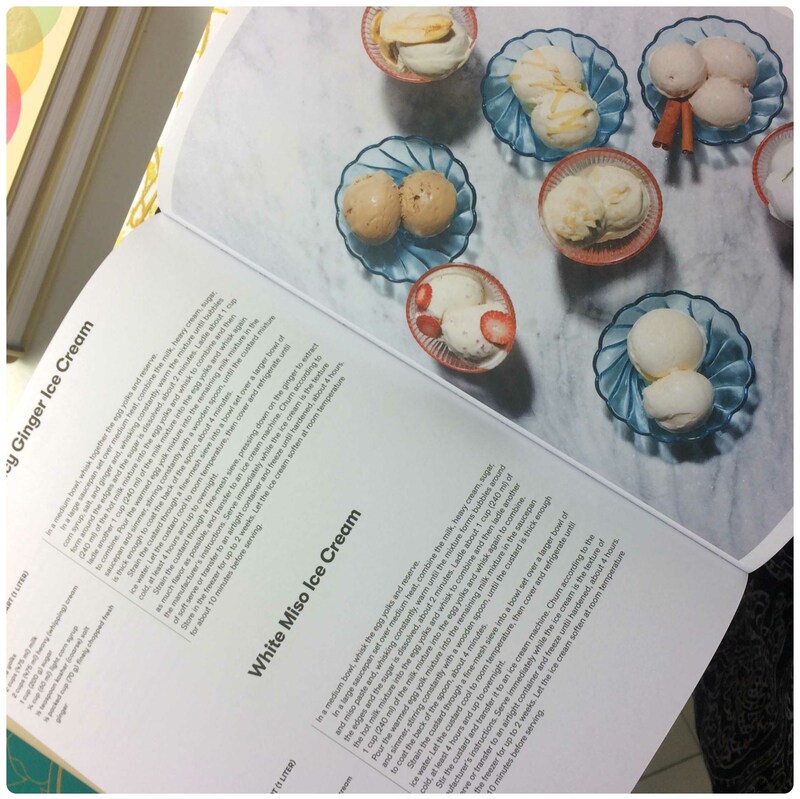 Recipes I Wanna Try Out (Soon)! 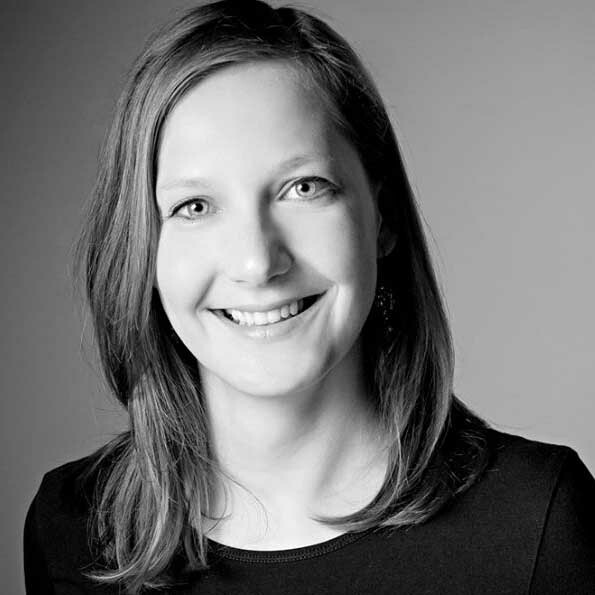 I am on my way to Munich where I will join the #dico16. So, no time for cooking today. 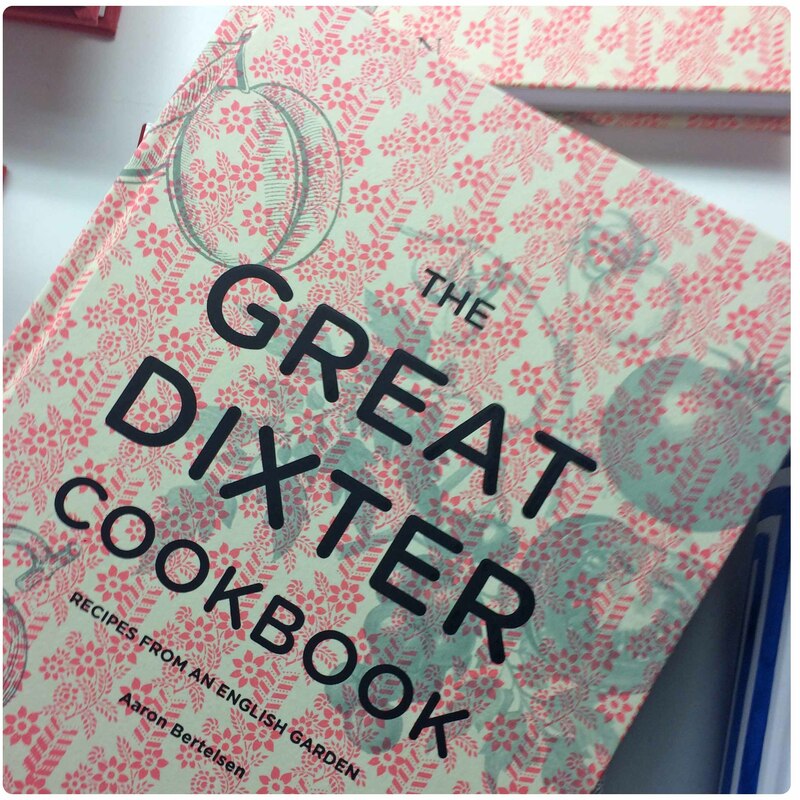 Nevertheless I am constantly collecting new recipe ideas I plan to try out soon. 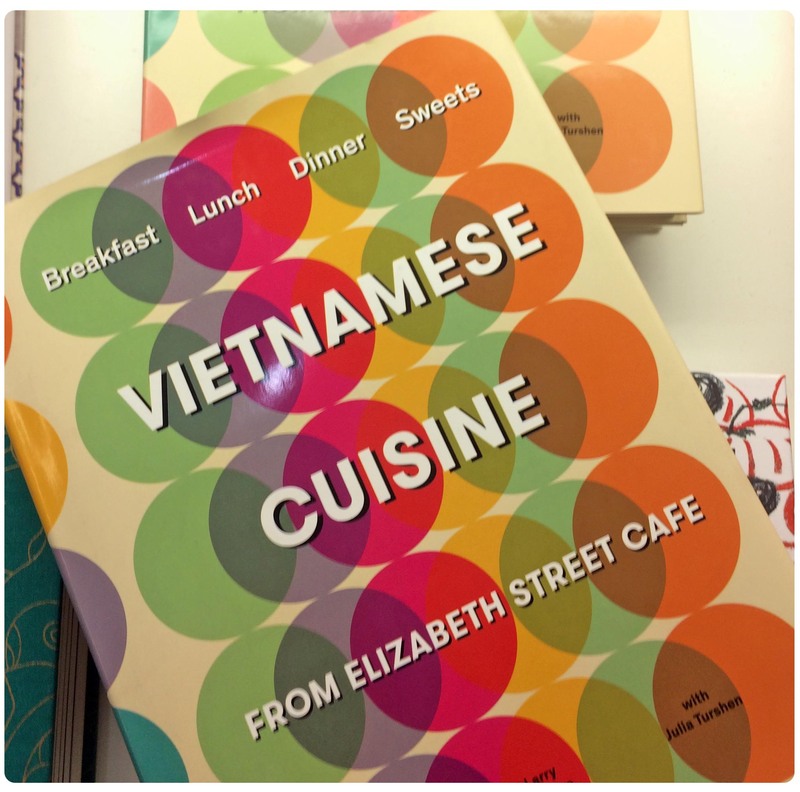 Here are six delicious looking examples. Apricot Jam Crostata via Food 52 – Butternut Squash Pie via Food52 – Palak Paneer via Food52. Red Pepper & Chilli Jam via Drizzle & Dip – Slow-Roasted Salmon via Food 52 – Torta della Nonna via Food52.